I'd like to send my fondest regards to Ruth for guest hosting the last Monthly Monthly. If you are looking for a great collection of sides then please do visit Ruth's grand selection of Sensational Sides. I love the flavor coffee and tea gives when added to a dish or baked goods. It creates a flavor experience unlike many others. This is exactly what I am looking for in this issue of the Monthly Mingle. Use the splendid flavors of your favorite coffee or tea blend in a dish. Bake a cake using spiced tea or create a sauce for your roast using a strong coffee flavor. If you like you can share the blend you used and why you chose it for your creation in your posts. Send me cakes, sweets, desserts, soups, roasts or ice-creams all flavored with coffee or tea. What I do not want is coffee or tea in its liquid form ;-). Your deadline is November 10th. Post about it on your blog anytime from now until 10 November (entries must be in English, please). Link to this post and send the details to me (see below). This is going to be an exciting mingle and I am looking forward to having you over. Challenging,but fun.Nice Theme Meeta,Let me see what I can do here! I left a comment before but I think it was lost. I said that it sounds interesting but difficult. I can think of something with coffee but have never used tea before. However, I do like challenges. Meeta. This one is really interesting. I have sent u my entry. Check your mail. Looking forward to see all the entries. will send pic and a write-up. Hope that's okay. thanks for an exciting theme Meeta. great theme! count me in! oh i love this theme! i've already got something done! watch out for my entry soon! I think I know just what to make... Thanks for the fun theme! glad you all are liking this theme! look forward to your submissions! Your blog is simply awesome. The recipes have an international touch. The pralines look so yummy! I am a new kid on the blog scene (I think I had emailed you too once earlier). 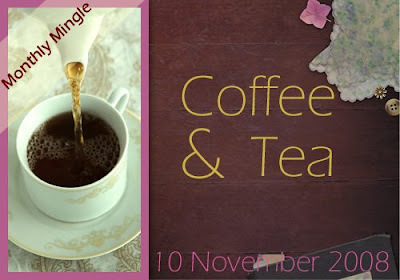 Anyways I will be participating in the monthly mingle this time. I'm sooo excited. Also I have a request, could you kindly help me with advice on how to improve my blog. I am no techie. Any and all advice will be appreciated. thnks for stopping by Meeta! I have this dessert with coffee which I have been wanting to make. Great options, Meeta! I have already sent you my sample. When you have free time, check it up at your e-mail, please!